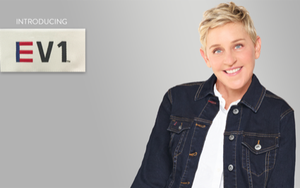 Comedian Ellen DeGeneres, no stranger to fashion forays, is teaming up with Walmart for a new line of clothing. Called EV1, the new women’s line, which the retailer says is inspired by great design, positivity and inclusion, is set to debut next month. It includes 60 mix-and-match items, all priced at $30 or less. With dressed-up denim, inspirational T-shirts and sneakers, the collection will make it easy for women in a wide variety of sizes to capture DeGeneres’ casual chic, according to the company. In addition to her own lifestyle brand, ED, which includes tabletop, furniture, linens and pet gear, she has partnered with the Gap on a girl-friendly clothing line called Gap Kids X Ellen DeGeneres, launched in 2015. The following year, the Gap apologized after an ad for the collection kicked over a bee’s nest on Twitter, with many viewers saying the photo, which showed a white girl propping herself up on an African-American child’s head, as racially insensitive. Walmart has been struggling to step up its style game, introducing a new partnership with Lord & Taylor, and buying up online retailers with strong millennial appeal, including Modcloth, Bonobos and Moosejaw.